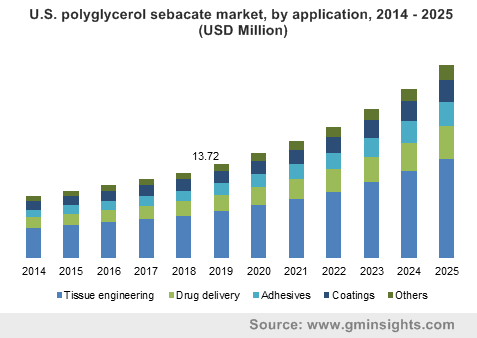 Global Polyglycerol Sebacate Market size was over USD 40 million in 2018 and will grow at a CAGR over 10.6% over the projected period. 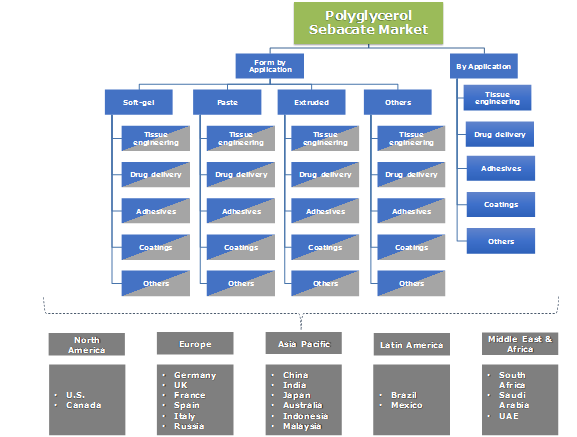 Polyglycerol sebacate is a biocompatible and biodegradable polymer resin formed by polycondensation of sebacic acid (from castor oil) and glycerol. PGS is used as an elastomer in coating of bio textiles such as valves, meshes made up of polyethylene, polyester among others. It is most widely used in tissue engineering especially for nerve and cardiovascular tissue regeneration application. It can also be extruded with some additives which can be used as a bone graft in joint replacement applications. Although the current market of PGS is very negligible and is under development phase, there exists a huge potential to replace other biomaterials such as polylactic acid, poly-L-lactic acid (PLLA), poly glycolic acid (PG), polycaprolactone (PCL) in future as PGS can mimic natural tissue in terms of flexibility. Also, it is soft in nature, robust and has low cost as compared to other biodegradable elastomers. Current applications of PGS elastomer includes nerve guidance, tissue regeneration, blood vessel reconstruction, drug delivery among others. These trends are anticipated to make noteworthy contribution to the overall PGS market size during the forecast timeframe. PGS elastomer finds application as tissue adhesives which can replace the conventional wound closure techniques such as sutures and staples. Also, these adhesives have many advantages such as they are not required to be removed once applied and are bioresorbable in nature, they are less painful and have simple implementation. PGS can be blended with different bioresorbable polymers such as polylactic acid, polycaprolactone in different ratios to obtain scaffolds which have high ductility and high cross link density along with better stretch ability. The market of PGS for adhesives application was estimated over 2.3 tons in 2018 and is estimated to reach 4.56 tons by 2025 growing at a CAGR above 10% annually. PGS elastomer can also be modified for better mechanical strength with addition of materials such as cellulose, carbon nanotubes and silicone-based fillers. With addition of these materials, the tensile strength of PGS can be modified which is further used in extruded products. PGS also finds wide application in biomedical application especially cardiology and ophthalmology. PGS membranes are increasingly being used in retinal transplantation to isolate photoreceptor layers in vivo. PGS is also widely used in tissue engineering especially in cardiac applications. The market of 3D printed scaffolds generated from PGS resin and elastomer are expected to rise in bone tissue regeneration application, which will have positive influence on the PGS market size in the coming years. Innovative product designs and advancements in robotics, rise in 3D printing devices, smart implants, nanotechnology, biologics and tissue engineering will contribute to the PGS market growth in the coming years. Overall, the demand of biomaterials is estimated to grow at a health rate taking in to considertation rise in population growth globally, improvements in healthcare facilities in developing countries, rise in medical tourism facilities, innovative technologies and design, and rising spending power on healthcare facilities globally. Developing countries such as China, India, Malaysia and Thailand will be potential markets for biomaterials in next 5 years as the rate of implants in these countries is less. In Europe, countries such as France and the U.K. offer healthy potential as they are less penetrated. 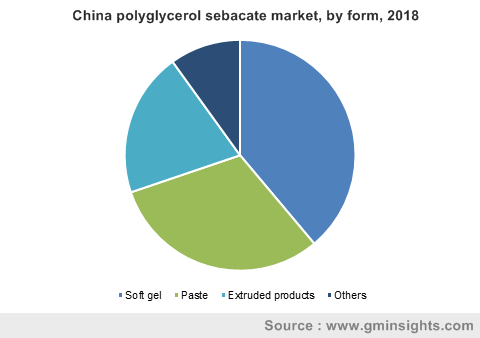 The report includes market analysis of different forms of polyglycerol sebacate which include paste, soft gel, extruded form and others. Soft gel and paste are the most preferred form of PGS which can be used for coating, adhesives and other small applications. PGS market for soft gel accounted for almost 35% of the total industry share followed by paste form and extruded products. Extruded products are used in tissue engineering and drug delivery applications in combination with other polymers such as polycaprolactone, polylactic acid. The market of extruded form of PGS was estimated at USD 8.2 million USD in 2018 and is expected to grow by 11.8% during the forecast period. Tissue engineering was the largest market for PGS elastomer in 2018 and is expected to grow at a faster rate as compared to other applications during the forecast period. PGS elastomer for coatings on bio textiles is an upcoming market with high potential. The market size of PGS elastomer for tissue engineering was estimated at USD 20.2 million in 2018 and is expected to grow by a CAGR of 10.0% during the forecast period. Drug delivery is also one of the fastest growing application for PGS, which is estimated to grow at a healthy CAGR during the forecast period. Geographically, North America is forecast to be the largest market of PGS owing to rise in old population and increase in lifestyle diseases such as obesity and others. North America dominated the PGS market due of prevalence of obesity and osteoarthritis patients along with higher spending on medical facilities especially in U.S. At present, Secant Group LLC is the only player in the PGS business, but it is estimated that companies operating in the biodegradable bone graft polymers space will enter the market soon. Europe PGS market size was more than USD 10.9 million by 2018 and is estimated to grow at a steady rate. Rising demand and awareness from developing countries in Eastern Europe will fuel the growth of biomaterials. Germany was the largest market for PGS in 2018 in Europe. At present only Secant LLC is a leading manufacturer of PGS resin globally. The resin is further sold to compounders and converters across globe for catering to different applications. At present majority of demand of PGS elastomer is in laboratories, R&D centers, universities. However, with advancement in technology the market will slowly shift to commercialization of this product. Polyglycerol sebacate (PGS) is a biodegradable and biocompatible elastomer made from polycondensation of sebacic acid and glycerol. This elastomer is being used in tissue engineering, drug delivery, in formulation of tissue adhesives, in coatings for bio textiles. The basic advantage of this material is that it close resembles to the properties of natural tissue and therefore it has gained much importance globally.